In what is no doubt a tightly coordinated effort to gain momentum from the Digital Economy Bill, a report has been written by BASCAP into piracy. • What is the contribution of the creative industries to the European economy in terms of GDP and jobs? • What are the consequences of piracy on retail revenue and jobs? • If current policies do not change in the EU, what will these losses be by 2015? It appears that from the start the research conducted was not to prove a hypothesis, but to support pre-supposed conclusions. Not the most auspicious start to conducting credible research. 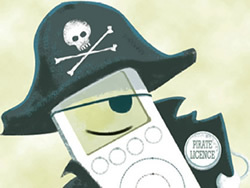 “To estimate the impact of piracy in creative industries most at risk (recorded music, film, TV series and software), the study analyses and integrates country-specific and industry-specific survey results in Europe’s five largest markets (the UK, France, Germany, Italy and Spain). In gathering the data for this study, the authors relied largely on data relating to digital piracy. “In the case of markets in which the transition to digital entertainment is less advanced, the data also reflects residual physical piracy. This study does not quantify direct losses affecting all creative industries. For example, the loss estimates reported here omit the total piracy losses experienced by TV sports broadcasters and sports interests throughout the EU. TERA is the name of the Paris-based consultancy contracted to write the report. In summary the report is a mix of statistics already circulated and guesstimates both of which have variable levels of accuracy. • The research is based on a hypothesis that all digital sharing is bad. Left Foot Forward has previously discussed research that shows “digital piracy” is more akin to trialling, like a sample given out in a supermarket or the test drive of a car. It ignores the WOM (word-of-mouth) benefits of digital sharing and evidence that it can boost media sales. • The hypothesis assumed the media businesses were otherwise well-managed and piracy was their sole problem. Examining the financial performance of the EMI Group and Warner Music Group, for example, shows evidence of business issues that are wider than piracy. Business insider Simon Napier Bell has documented the reasons why many media companies have suffered. In fact it was only the rise of the CD and back catalogue sales of older artists which helped it grow meaningfully throughout the 80s and early 90s. Software company Microsoft found a considerable improvement in software sales in previous high-piracy countries with a new pricing strategy which provided consumers with copies of Windows at a more reasonable price. • The report’s data suggests every pirated copy of content is a direct substitution of a legitimate sale. That is as ridiculous as assuming every fake Lacoste shirt, Louis Vuitton and Chanel handbag represent a lost sale of the real item. It ignores the fact that the money and time spent on purchasing these items are more likely to be spent in other ways: for instance additional mobile phone airtime or additional time chatting to friends on social networks – content creation rather than content consumption. • The report assumes there will continue to be a linear relationship between jobs and company revenue. This isn’t the case, digital technologies allow media companies to scale revenues without a corresponding proportional increase in operational employees. • Finally, the report pulls together data from lots of different sources which were not gathered under a uniform criteria and would be based on different assumptions and scenarios. It is like trying to compare apples with potatoes. Should action be taken to help the creative industries? Yes, it should. But that action should help them embrace new opportunities, clean house with their management teams, re-engineer their businesses and adapt a copyright regime that is fair and equitable to rights holders and consumers in the digital age. We have to get tough on piracy; I think it threatens jobs.